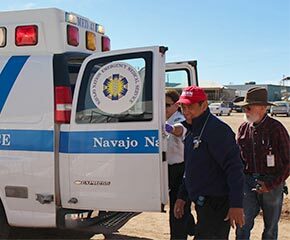 RNRN/NNU nurses just returned from a deployment providing medical assistance at the 70th annual Navajo Nation fair in Window Rock, Arizona. Our team consisted of RNs from California, Colorado, Louisiana and Oregon. The Navajo Nation fair is the largest Native American fair in the country (it can draw up to 300,000 people). The fair is a great source of pride and celebration but the sudden influx of so many people to a usually rural area overwhelms the local hospital, Tsehootsooi Medical Center. 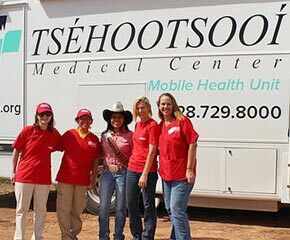 RNRN/NNU collaborated with Tsehootsooi Medical Center in order to address the urgent need for assistance during the fair. RNRN volunteers worked at a first aid station and mobile unit at the fair to attend to first aid needs on site. RNRN volunteers were able to help with the usual first aid – minor scrapes and dehydration, etc. – as well triaging other cases. 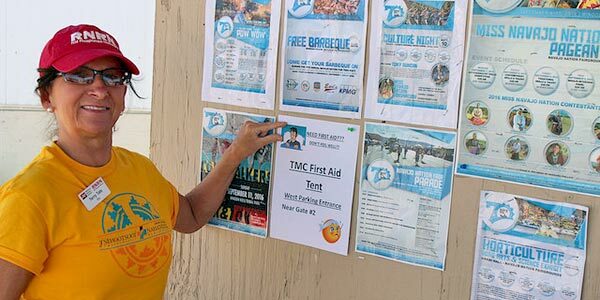 We are very proud of our nurses commitment to lending their time and expertise when needed, and of our collaboration with the Navajo Nation on this project to keep everyone safe during the 70th annual Navajo Nation fair.